You all must be thinking that how did I forget India in this series of International Flatbreads. 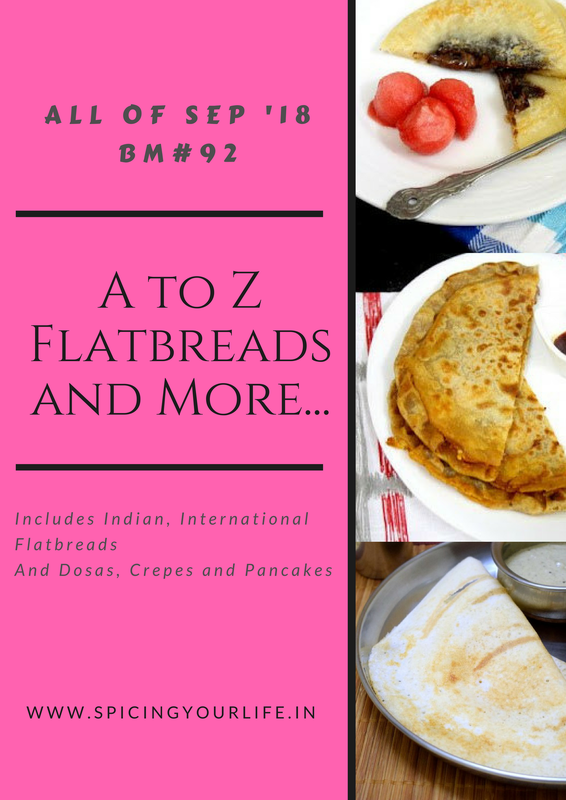 No I did not, but being an Indian I knew many flatbreads soI have purposely kept the Indian flatbreads for the difficult letter’s, like u,v,w,x,y,z. So when I finally shortlisted all, which was till last week I decided for Warqi Paratha for the letter W. So what is Warqi Paratha?. Warqi Paratha literally means layered paratha. (warq means layer) similar to laccha paratha but with a complete different method of preparation. Laccha Paratha is usually folded like a fan, and then in circular roll and then flattened out again. Check out my recipe of Whole wheat Laccha Paratha or Layered Paratha here. Warqi paratha is folded in half many times to create as many layers as required and then flattened out again. Many recipes even recommend keeping the dough refrigerated for some time before rolling out the paratha. This makes the paratha more flaky and full of layers. I did follow the Warqi Paratha recipe from here. We paired this paratha with some spicy Chole and loved it to the fullest. Warqi Paratha is a layered paratha that is folded many times to form multiple layers. This can be enjoyed with some spicy curry. In a large bowl, Add the flour, sugar, salt, milk and ghee. Mix everything, and then knead well to form a smooth and soft dough. Use milk only to make the dough. After 30 minutes, roll the dough into a large rectangle. Then apply some ghee and sprinkle some flour on top of it. Fold it one above the other or grab both the edges and align it in the center to form an envelope. Again apply ghee and sprinkle flour till you get a small rectangle. The key here is to have as many layers as one can have. After 15 minutes repeat the above 4 steps and refrigerate again for 15 minutes. In all you would need to refrigerate minimum 3 times. After the last refrigeration, roll out the dough again and use a cookie cutter or the back of a saucer and cut into circles. You can lightly roll the circles again to thin the paratha's or to enlarge it if your paratha looks too thick. Alternatively one can divide the dough into equal size balls and roll each like a paratha. Shallow fry them using ghee on medium until golden from both the sides. Once cooked, hold the paratha in a clean kitchen towel and lightly crush it within your palms so that the layers come out. Enjoy it hot with some spicy curry. Today is certainly the day of warqi parathas. Yours has turned out flaky with such nice layers. Yum! Warqi parathas looks absolutely super ultimate and droolworthy. How flaky they looks na.. Even i sticked with Warqi paratha and enjoyed making this incredible rich parathas. Well done Renu. Same pinch. Warqi parathas win the day! And you have done a fabulous job with these. I chose the healthier route and made them with whole wheat flour. Wow they have come out so flaky and perfect. Seriously super tempting it looks. And the recipe seems to be easy to follow too. Thanks for sharing. Warqi paratha is absolute favorite at my place. I add salt and black pepper and rest of the procedure is same. We enjoy it with eggs and a hot cup of tea. Making warqi paratha definitely a task but I love the outcome. You nailed the recipe. Never tried warqi paratha..but yours look so flaky and perfectly layered. Would make a wonderful pair with raita and some masala tea. Wow, nice share..looks absolutely delicious! Oh my that looks amazing, our own puff pastry !! Would love to enjoy this yumm paratha with a spicy curry!! I love this type of layered parathas a lot. Seeing so many warqi parathas today, I am tempted to make it for my daughter. The parathas look fantastic Renu. Warqi paratha is great hit with W… LOve the flaky and crispy paratha recipe. Same pinch ! Though we have quite a few Warqi parathas today each one is unique in its own way . Isn’t it amazing that one paratha has so many variations for making it ? Awesome crisp Parathas – perfect with any curry , I wouldn’t mind enjoying them on their own too . Oh gosh this is sinful!..your warqi paratha looks so inviting …and I think this one topped the list for the day right..you got it done so well! Wow Renu, perfect layered flatbread, super super tempting. I’ll have to try making them as its seems the flatbread of the day. I remember shortlisting this one but made something else! The warqi paratha looks perfect and crispy! wow Renu, you made this flaky warqi paratha like my mother. drooling here with this crushed look and with chole I just want some. Warqi paratha definitely won the show today. I am in love with each and every recipe and the unique ways to fold the paratha to get the perfect layers.